THE FEDERAL Reserve may be nearing the end of its interest rate-tightening cycle, but some local stock experts are unconvinced that will translate into a rebound in the market this year. In fact, some local financial gurus are either downright bearish or, at best, lukewarm on the major indexes' chances of staging any kind of meaningful advance in 2006. 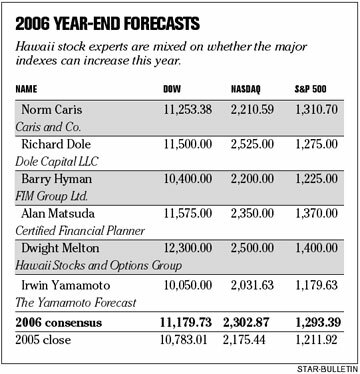 Maui-based investment adviser Irwin Yamamoto, for one, thinks the Dow Jones industrial average could fall below 10,000 during the year before recovering. The contrarian investor expects the Dow to end the year down more than 6 percent at 10,050. He also thinks the Nasdaq will end the year off greater than 6 percent and the Standard & Poor's 500 index to fall in excess of 2 percent. Yamamoto, editor and publisher of The Yamamoto Forecast newsletter, is recommending to his clients that they keep all their cash in a money-market bank account that currently yields more than 4.3 percent. But then there are bulls like Dwight Melton, co-founder of the Hawaii Stocks and Options Group. He sees the major indexes this year surpassing their 11 percent historical averages with the Dow hitting a record 12,300, up 14 percent from where it started the year at 10,783.01. So with those extremes as a prelude, it's once again time for the Star-Bulletin survey of best investment ideas for 2006. There are twice as many participants as last year with each of the six experts receiving a hypothetical $20,000 portfolio. The rules are largely similar to 2005 in that the experts are allowed to change their picks at the end of each quarter. Their investments have to trade on a U.S. exchange or can be cash. Index funds are eligible but mutual funds are not in order to simplify the process and make the picks more distinguishable. Investments were chosen in mid-January, but for calculation purposes, gains will be determined from the start of the year. Readers should keep in mind that it's likely the experts either own shares in their selections for themselves or for their clients. Melton, the two-time defending contest champion, said he wanted more competition after fashioning a 72 percent return in his portfolio last year in a flat market. But in a one-year portfolio, it's equally as important to preserve capital. Hence, some of the experts have played it safe rather than chase the high-fliers. Returning from last year are Melton; Barry Hyman, vice president-management team for the Maui branch of Michigan-based FIM Group Ltd.; and Richard Dole, chief executive of investment banker Dole Capital LLC. Alan Matsuda, a Certified Financial Planner and Registered Investment Advisor, is back after a year's absence. Newcomers are Kauai-based Norm Caris, managing director-institutional sales for Caris and Co., a national institutional research firm; and Yamamoto, who publishes a monthly financial newsletter. Yamamoto, the most negative of the group, said record consumer debt levels has him running for the highest-yielding bank money-market account, currently UmbrellaBank.com, where he can get in excess of 4.3 percent risk free for a deposit of at least $10,000. Yamamoto bases his pessimistic outlook on escalating energy costs and rising interest rates that have hit consumers in the pocketbooks, and credit-card delinquencies that are at their third-highest level on record. "The coming drop" in real estate prices also will carry negative implications, he added. He said the current price/earnings ratios of stocks are almost 40 percent overvalued. "No, I don't see the end of Western civilization," he said, "but it would be prudent to be defensive in 2006." Hyman, who said at the start of 2005 that the best investments were overseas, hasn't changed that option. He also is defensive and expects another flat market this year with the Dow finishing slightly in the red for the second year in a row. "We believe that for domestic investing defense is the best offense in the current valuation environment," said Hyman, who posted a 12.5 percent return in last year's contest. "Overleveraged U.S. consumers could pare back spending, which would negatively impact economic growth, corporate earnings and market multiples." Hyman said key variables include hiring trends and the willingness of Asian central banks to continue to subsidize U.S. consumption by buying this country's debt. Given his outlook, Hyman is going with two of the same picks he made last year. One of them is Financial Industries, a restructuring U.S. insurance company that is trading at a price that Hyman's firm believes is below fair value. The other repeat investment is Western Asset/Claymore U.S. Treasury Inflation Protected Securities Fund 2, which Hyman said hasn't caught investors' attention yet. "(Western Asset) is a way to buy TIPS currently at a sizable discount to the net asset value of the actual securities in the portfolio," Hyman said. "It is a relatively low-risk way investors can benefit not only from the income and inflation protection of TIPS, but it has built-in potential growth as well since at current prices you are buying $1 worth of bonds for about 89 cents." Hyman's new picks are iShares Lehman 1-3 Year Treasury Bond Fund; streetTRACKS Gold Trust, which tracks the price of gold bullion; and Liberty Global -- Series C, a global cable company. "Liberty is a compelling opportunity to penetrate or consolidate Europe, Asia and South American cable markets, but since it trades in the U.S. and it is dollar denominated, the foreign benefits will be somewhat muted," Hyman said. Matsuda, like Hyman, likes streetTRACKS Gold Trust because "it avoids the risk involved in picking gold-mining companies." His other choices are Scudder Global Commodities Stock, a closed-end fund that owns companies mostly involved with energy and industrial materials; and iShares MSCI South Korea Index Fund, a play on that country's economy. "Raw materials prices are rising as the Chinese bid prices higher and higher," Matsuda said. "China's central bank's nervousness about holding billions of U.S. dollars in reserves may result in their buying precious metals, such as gold, and commodities." Matsuda has opted to put the rest of his money in cash to earn the 4 percent-plus interest currently available, but notes that Mexico-based cement maker Cemex S.A. is on his radar list if its stock price drops. Caris, like Yamamoto, sees a bear market developing in real estate, particularly high-end housing in California and Hawaii. To that extent, he said even though Caris and Co. has a "hold" on Honolulu-based Alexander & Baldwin Inc., the firm has been telling clients to short the stock. Shorting, which isn't allowed in this contest, allows an individual to borrow stock and then immediately sell it, betting the price will drop so that the investor can later return the shares to the lender at a lower price. Caris said that while it's possible the major indexes could be up 5 percent this year, it just as easily could be down a similar amount. "We don't look for the averages to do anything more than 5 percent up or down, which would imply flat," he said. Caris likes one local stock, Hawaiian Airlines parent Hawaiian Holdings Inc., because of its improved financial situation after bankruptcy and the weakened condition of Aloha Airlines, which is still trying to emerge from reorganization. His other favorites are Oakley, an optical supplier that makes high-performance sunglasses and goggles for the sports and fashion market; Sirius Satellite Radio, which now offers shock jock Howard Stern among its programming choices; Novellus Systems, which makes semiconductor production equipment; and Unifi, which produces and processes textile yarns. Sirius drew a lot of attention when it hired Stern and has been ramping up its schedule. "Subscription growth is phenomenal, probably underestimated by much of Wall Street," Caris said. "Our numbers are higher than consensus. It has good potential in areas poorly covered by traditional radio like Hawaii." Caris said Oakley's new innovative products will drive growth at the company. Its newest creation is O ROKR, a collaborative product with Motorola that offers Oakley sunglasses equipped with both wireless music and wireless communication. He sees Novellus as being a good play on global integrated growth. "Semiconductors are in the middle of an upcycle and semiconductor chipmakers are significantly underinvested in capital equipment," Caris said. Unifi, he said, is trading at less than one-half book value (a company's net worth) and that it recently hired a chief financial officer "to unlock shareholder value." Dole, who had a 5 percent return in last year's Star-Bulletin contest, is sticking with four of the same picks he ended up with at the end of 2005 -- Alexander & Baldwin, which owns ocean shipper Matson Navigation Co. and Hawaii real estate; Pfizer, the world's largest drugmaker; Lockheed Martin, the biggest U.S. defense company; and Newport, a supplier of scientific and technical instruments. He's adding the Nasdaq-100 index, which tracks the largest non-financial stocks on that index. As for A&B, Dole has a different take than Caris on the company, which has put forth a proposal to develop the Kakaako waterfront. "A robust real estate outlook with lower-than-average cost of capital, added to new development prospects in Kakaako, are among the reasons I like the stock," he said. "I see the strong Hawaii economy helping shipping, plus the new China venture." Still, Dole expects "slow growth at best" for the stock market with continued interest rate pressure, high energy costs and continued government spending in the defense industry. He said health care, technology, defense and consumer staples should do best in this type of environment. Melton is the most optimistic of the group with his 12,300 Dow prediction, but tempers his enthusiasm with this caveat: "My forecast assumes that the Fed is near the end of the tightening cycle, that oil will remain close to current levels, and that things will not fall apart globally." His selections of Apple Computer and energy stocks propelled him to last year's 72 percent gain in the contest, and he's sticking to several of the same choices. Melton likes Apple again, as well as holdover energy picks Cal Dive International and Southwestern Energy. Southwestern was up nearly 184 percent last year and split its stock twice while Cal Dive rose 76 percent and had one stock split. Apple soared 123 percent and also split its shares. Melton's new picks are memory device maker SanDisk, up nearly 152 percent last year, and Joy Global, which makes heavy equipment for the coal-mining industry and which soared nearly 110 percent in 2005. SanDisk's products are designed primarily for digital cameras, multimedia cellular phones and USB flash drives. "Demand has been rising rapidly, and flash memory is being used in more products, such as cell phones, digital music players and game machines," Melton said. "Given this growing market, and SanDisk's moves to quickly reduce prices, I look for continued strong demand for its products." Melton likes Joy Global because the company is looking for a 15 percent jump in revenue this year over a year ago. "Coal prices have appreciated sharply since 2004, prompting major producers to ramp up their mining activities," he said. Despite Melton's bullish outlook, he acknowledges that the unknown always can torpedo a market. "Investors will be focusing on developments at the Federal Reserve, in the oil markets and on the global front," he said. "Unwelcome surprises in any of these areas, which might include more than one or two additional interest rate increases, a surge in oil prices, or an escalation in tensions in the Middle East or with North Korea, could cause the economy to sink into a recession," he said.